Do you want to apply for a birth certificate in Kenya? In this article, we will take you through the process of getting a Kenyan birth certificate. The birth certificate is the first step towards the full exercise of citizenship. It proves your existence, your place and the date of birth, it is a legal document that proves and provides the names of your parents. Why is a Birth Certificate in Kenya that important? This is because of the birth certificate number Kenya. Without this document and the birth certificate number, citizens are deprived of their most fundamental rights and have no access to social programs and other government services. These services and documents include; National ID Cards, passports application, visas application, application for employment, or even registering for final exams in primary and secondary schools. Getting a Birth Certificate in Kenyans falls is same as registration of persons in Kenya is done under the office of the president in Kenya, the ministry of interior and co-ordination of National Government of Kenya, immigration and registrations of persons. With this Digital Age, you can now apply for a birth certificate in Kenya online through the government eCitizen portal check below for instructions on how to apply for a birth certificate in Kenya through the eCitizen website. If you are a new parent i.e you are registering for your newborn baby who is less than 6 months old. This is the best time because it is much easier to go through the process. This is a very vital step in a child’s life because it marks the first step of being recognized officially by the state as a citizen of this country. A fee of Ksh 90/ – ksh 200/- ( The fee may change from time to time). 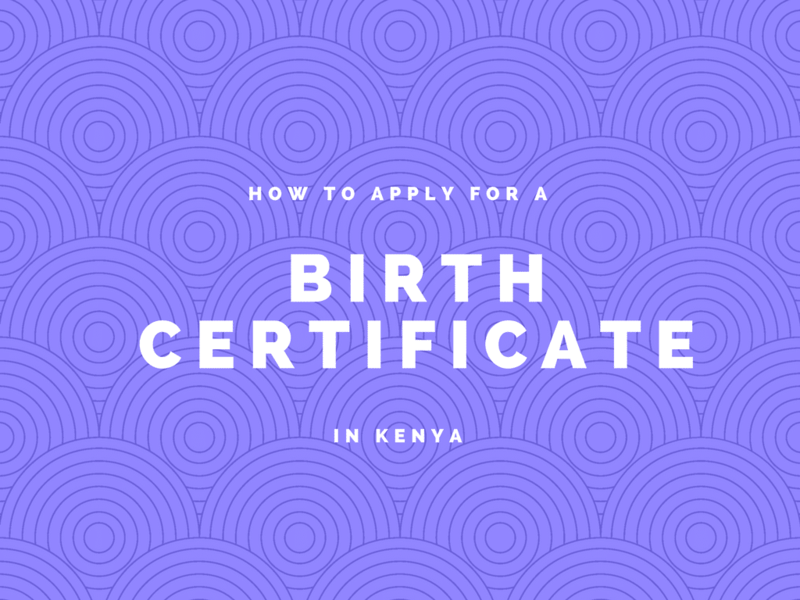 Please note that a birth certificate is given free of charge if the application is made within the first six months of birth, however, a convenience fee of Kshs 50 is charged to facilitate the process. The fee is different for late registration or registration as an adult. All you need to do is obtain and fill out and submit a form from the District Birth and Death Registries. However, if your child was born at home, the Sub-Chief is authorized to register births in his location. In Nairobi, all births are registered at the City Hall. Any birth that has a notification that has not been forwarded to the immigration department within the first six months after the child is born is termed late registration. For this, you will need the following in order to register for a birth certificate. Certificate of doctor or midwife who attended the birth. The third scenario is when you are living abroad and would like to register for your child. You need to visit the embassy where you live. This process takes much longer than the others since your documents have to be sent from Kenya. This is only applicable if the child was born outside the country but to Kenyan parents. Two (2) self-addressed, stamped A5 envelopes for postage purposes. Two(2) copies of parents’ marriage certificate either international or translated into English if legally married. Please note that the processing time takes 3 months or more depending on the time it takes for the authorities to verify parents citizenship details. Adults with notification cards can visit the nearest District Birth and Death Registrar, armed with a copy of your National ID Card. The Officials will give the B1 form to fill. Baptism card and primary school certificates may be accepted in special circumstances. A fee of Kshs 100 may apply. The government of Kenya has made it more convenient to apply for a Birth Certificate from wherever you are. All you need is time to create an account on the ecitizen website and continue the registration process. the good thing about this is that you can do it from the comfort of your smartphone and complete all the money transactions and go pick it at Bishop House at your own time. All you need is for creating an account is your phone number, National ID Card Number, and an E-mail address. Upon successful registration, you will log in to your account and you will see several services that are available that you can request. Look at the image below for what to expect. The following is the process for Birth certificate Kenya replacement procedure in Kenya. Most people often ask What to do if I lost my birth certificate in Kenya? How do I replace a lost birth certificate? Well, it is easy than you think and just read on. All you have to do is visit any Huduma Center closest to you and they will take you through the process of applying for a lost birth certificate. You will get a new one and be able to access important Government services.